If you’ve been gaming as long as I have, you’ll remember when the great adventures of the day — Gygax’s Tomb of Horrors, say, or Descent Into The Depths of the Earth — came packaged as slender stapled sheets wrapped in a two-tone cover. Color arrived years later, and adventure modules got thicker and more elaborate. In the mid-80s TSR dazzled gamers with the first boxed adventure sets, including the World of Greyhawk, The Ruins of Undermountain, and the fabulous Menzoberranzan, home of the Drow. These weren’t just game modules — they were entire campaigns, weeks or even months of epic subterranean exploits crammed into a cardboard carton. There was nothing like opening up Dragon Mountain or Dark Sun for the first time, and seeing reams of folded maps and dense booklets promising near-limitless adventure. Alas, it was not to last. TSR published its last boxed adventure in the late 90s. By the time Third Edition D&D arrived they had vanished, replaced with bland adventure books. Boxed sets were too expensive to produce, pundits said. And modern gamers want to be able to flip through books before they buy, see what they’re getting. The rest of the gaming industry followed D&D‘s lead, and the beloved boxed set appeared to have disappeared for good. Something unnatural is stirring in the small fishing village of Fauligmere. Legends of a swamp witch are whispered among the superstitious townsfolk. And if it weren’t for the haunting voice coming from the mists of the Cursed Marshes, you might laugh at such tales. But in Fauligmere, nothing is as it seems. The Witch’s Song is a standalone adventure for Warhammer Fantasy Roleplay, introducing new rules and options for hedge wizards and witch characters. This boxed adventure features a full-colour book detailing this mysterious adventure in a suspicious town, as well as all the sheets, cards, and tokens a GM needs to bring the story to life. Players must investigate the mysteries that plague Fauligmere, gain the favour of the people, and learn the truth behind the town’s legacy. 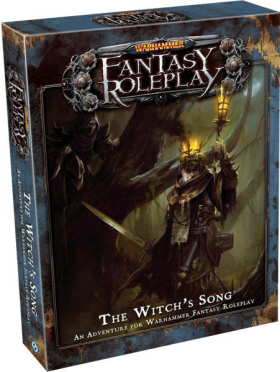 Can you resist the lure of the witch’s song? Typical for Fantasy Flight, the production values and art are top-notch. Best of all, they don’t skimp on that most essential aspect of the boxed adventure: the goodies. The Witch’s Song, for example, is packed with dozens of play aids, including action cards, location cards, creature cards, player handouts, party sheets, and more — most illustrated in full color. Is it too much to believe this is the start of a new trend? In May of last year, Wizards of the Coast released The Shadowfell, the first D&D boxed adventure in more than a decade. Since then, they’ve followed up with Madness at Gardmore Abbey. It’s still too early to declare a true return of the boxed adventure, but I’m keeping a weather eye out. I still occasionally enjoy going to the shelf, pulling down one of those old boxed sets and thumbing through it. I used to obsess over the maps, especially city maps. Yes! I only used a fraction of the boxed adventures I purchased in my own campaigns. But the best of them spurred my imagination in the best way, and it was usually the wonderful maps that had the greatest impact. I wanted to be able to create adventures and settings of a similar stature and level of detail for my own players, and eventually I did (though it took nearly a year of dedicated effort). To repeat something I said on Facebook (or Twitter? ), I really wish they’d start publishing fantasy novels in those boxed sets, complete with a pair of folded 17×22 maps. I suspect you’re not alone. That would have made immersing yourself fully in the world even easier. If memory serves, one or two of the TSR boxes sets may have come packaged with a novel. Although perhaps I’m remembering the SSI computer games, which included a D&D novel from time to time (I know the POOL OF RADIANCE sequel did, and perhaps one of the DRAGONLANCE games). Not even game-related, necessarily — I’m imagining a Seven Princes boxed set, or Malazan, or Shattered World. You mean a boxed set focused on the novel and its setting exclusively? Seems like that’s an untapped market… but I see how, done right, it could be very compelling. Yep. I’m sure it’s entirely impractical and won’t ever happen, but I still think it’s a nice thought — if nothing else, it’d address the issue that with an eBook it’s really hard to flip back & forth to the map . . .